At last! 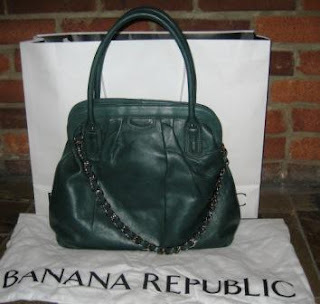 Banana Republic’s Filmore deep satchel in teal is the bag I have been searching for. Its deep satchel shape, gathered leather along the frame, and fabulous shade of teal that complements everything have elevated this bag to my top two favorite bags. I have been watching it for weeks, but grabbed it in-store as soon as I learned it had sold out online. Shades of gray are hot for fall and this bag is the perfect accessory. 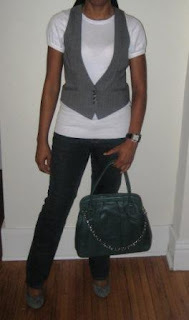 See how it completes my twist on the menswear inspired look. Next Post Max Studio delivers by way of Marshalls! lucky girl! i want one, too! BR has some really nice bags this season. Mel, would you believe I got it on clearance for $20 in the Banana Republic factory store here in STL?